Ricardo Valverde dedicated himself to photographing East Los Angeles, determined to disrupt the history of image making. He understood that his community and its inhabitants had been, as author Ramón García notes, either overlooked or romanticized — or feared. Valverde’s street photography and portraiture, work done primarily in the 1970s and 1980s, offered a powerful counternarrative. Although Valverde documented people, places, and events in East Los Angeles, his images are never simply documentary. His work can be enigmatic, even disquieting — qualities enhanced in mixed-media works completed in the decade before his death in 1998, in which he altered earlier photographic prints by marking, painting, and scratching them. In this consideration of Valverde’s life and work, García traces the photographer’s career from his early investment in a documentary style to the development of an expressionistic aesthetic. García’s analyses reveal the modernist and postmodernist impulses that propelled Valverde’s art, as well as Valverde’s resolution to record his East LA community. "Ramón García deftly writes Ricardo Valverde into the history of international photography from specific cultural locations. Valverde's fine art photographs generated scenes of Los Angles from the late 1960s to the late 1990s: east side family life, bohemian artistic circles, and the built environment of a major US city undergoing a transnational shift. García—a wordsmith of clarity and animated style—makes a convincing case." 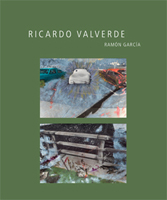 — Roberto Tejada, author of "National Camera," "Celia Alvarez Muñoz," and "Full Foreground"
"Ramón García’s exhaustively researched book is a testament to the artistic and political life of Ricardo Valverde and the other Chicana/o artists who documented Los Angeles during the 1970s, 1980s and into the 1990s. Often overlooked or—worse yet—dismissed by academic and artistic institutions alike during his lifetime, García has succeeded in making Valverde’s legacy impossible to diminish or ignore."